Fasces from the Latin word fascis, meaning “bundle”) is a bound bundle of wooden rods, sometimes including an axe with its blade emerging. The fasces had its origin in the Etruscan civilization, and was passed on to ancient Rome, where it symbolized a magistrate’s power and jurisdiction. The image has survived as a representation of magisterial or collective power. By the time of the Roman Republic, the fasces had evolved into a thicker bundle of birch rods, sometimes surrounding a single-headed axe and tied together with a red leather ribbon into a cylinder. On certain special occasions, the fasces might be decorated with a laurel wreath. The symbolism of the fasces suggested strength through unity; a single rod is easily broken, while the bundle is very difficult to break. The axe represented the power over life or death through the death penalty, although after the laws of the twelve tables, no Roman magistrate could summarily execute a Roman citizen. The axe indicated that the magistrate’s judicial powers included capital punishment. Fasces carried within the Pomerium—the boundary of the sacred inner city of Rome—had their axe blades removed; within the city, the power of life and death rested with the people through their assemblies. An occasional variation on the fasces was the addition of a laurel wreath, symbolizing victory. This occurred during the celebration of a Triumph – essentially a victory parade through Rome by a returning victorious general. Numerous governments and other authorities have used the image of the fasces for a symbol of power since the end of the Roman Empire. It has also been used to hearken back to the Roman republic, particularly by those who see themselves as modern-day successors to the old republic and/or its ideals. Italian Fascism, which derives its name from the fasces, arguably used this symbolism the most in the 20th century. The British Union of Fascists also used it in the 1930s. 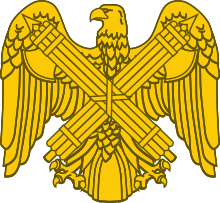 However, the fasces, as a widespread and long-established symbol in the West, has avoided the stigma associated with much of fascist symbolism, and many authorities continue to display them, including the federal government of the United States. Several offices and institutions in the United States have incorporated representations of the fasces into their iconography. In the Oval Office, above the door leading to the exterior walkway, and above the corresponding door on the opposite wall, which leads to the President’s private office. Note: the fasces depicted have no axes, possibly because in the Roman Republic, the blade was always removed from the bundle whenever the fasces were carried inside the city, in order to symbolize the rights of citizens against arbitrary state power. Two fasces appear on either side of the flag of the United States behind the podium in the United States House of Representatives. The official seal of the United States Senate has as one component a pair of crossed fasces. Fasces ring the base of the Statue of Freedom atop the United States Capitol building. A frieze on the facade of the United States Supreme Court building depicts the figure of a Roman centurion holding a fasces, to represent “order”. The grand seal of Harvard University inside Memorial Church is flanked by two inward-pointing fasces. The seal is located directly below the 112 m (368 ft) steeple and the Great Seal of the United States inside the Memorial Room. The walls of the room list the names of Harvard students, faculty, and alumni that gave their lives in service of the United States during World War I along with an empty tomb depicting Alma Mater holding a slain Harvard student. The National Guard uses the fasces on the seal of the National Guard Bureau, and it appears in the insignia of Regular Army officers assigned to National Guard liaison and in the insignia and unit symbols of National Guard units themselves. For instance, the regimental crest of the 71st Infantry Regiment (New York) of the New York National Guard consisted of a gold fasces set on a blue background. The Mace of the United States House of Representatives, designed to resemble fasces, consists of thirteen ebony rods bound together in the same fashion as the fasces, topped by a silver eagle on a globe. The main entrance hallways in the Wisconsin State Capitol have lamps which are decorated with stone fasces motifs. At the Lincoln Memorial, Lincoln’s seat of state bears the fasces—without axes—on the fronts of its arms. Fasces also appear on the pylons flanking the main staircase leading into the memorial. The official seal of the United States Tax Court bears the fasces at its center. Four fasces flank the two bronze plaques on either side of the bust of Lincoln memorializing his Gettysburg Address at Gettysburg, Pennsylvania. The fasces appears on the state seal of Colorado, US, beneath the “All-seeing eye” (or Eye of Providence) and above the mountains and mines. The hallmark of the Kerr & Co silver company was a fasces. On the seal of the New York City borough of Brooklyn, a figure carries a fasces; the seal appears on the borough flag. Fasces can also be seen in the stone columns at Grand Army Plaza. Used as part of the Knights of Columbus emblem (designed in 1883). Commercially, a small fasces appeared at the top of one of the insignia of the Hupmobile car. A fasces appears on the statue of George Washington, made by Jean-Antoine Houdon which is now in the Virginia State Capital. Columns in the form of fasces line the entrance to Buffalo City Hall. VAW-116 have a fasces on their unit insignia. San Francisco‘s Coit Tower has two fasces-like insignia (without the axe) carved above its entrance, flanking a Phoenix. The seal of the United States Courts Administrative Office includes a fasces behind crossed quill and scroll. In the Washington Monument, there is a statue of George Washington leaning on a fasces. A fasces is a common element in US Army Military Police heraldry, most visibly on the shoulder sleeve insignia of the 18th Military Police Brigade and the 42nd Military Police Brigade. Two monuments erected in Chicago at the time of the Century of Progress Exposition are adorned with fasces. The monument to Christopher Columbus (1933) in Grant Park has them on the ends of its exedra. The Balbo Monument in Burnham Park, (1934) a gift from Benito Mussolini, has the vandalized remains of fasces on all four corners of its plinth.